This page gives the details of where I purchased lab-created diamonds for an engagement ring, why one might prefer such diamonds, and how we had the diamonds set into a custom-designed ring. We are not associated with any of the companies or products discussed, except as happy customers. This page includes a couple photos of our ring, plus a video of it sparkling in sunlight. For more pictures, including higher-resolution versions of the ones here, see the separate page with several captioned photos. As you can see from the pictures, our ring consists of a big yellow/orange diamond surrounded by a pair of smaller white diamonds in turn surrounded by a slightly smaller pair of blue diamonds. Without going into specific weights, the big stone is between 1 and 2 carats, and each of the 4 smaller stones is under 1/2 carat but more than 1/5 ct. The big diamond is a fancy vivid orange yellow emerald-cut from Adia Diamonds, a joint venture between Pearlman's jewelers, in Michigan, and a Canadian company, AOTC. Adia appears to have changed its name to D.NEA Diamonds, but is still associated with AOTC. One used to be able to find Adia loose stones on Pearlman's website as well as the Adia website, but this may not be true for D.NEA. The two white stones come from Apollo Diamond, in the Boston area. The blues are from Chatham Created Gems and Diamonds, a San-Francisco based company. The ring itself is platinum, and the design and production were done by a local jeweler. The yellow/orange and blue stones were produced by the more established and common synthetic diamond process known as High Pressure High Temperature (HPHT). The white stones were produced by a newer process known as Chemical Vapor Deposition (CVD). Apollo was the only manufacturer producing gem-quality diamonds using CVD at the time. natural diamonds. Most of the jewelry I saw from Apollo contained only Apollo white synthetic diamonds. I haven't seen, nor seen any mention of, any jewelry that contained both colored and white lab-created diamonds. Nor have I heard of any that contained both HPHT and CVD created diamonds. I wonder how many other pieces currently exist that combine these things, like ours. Could ours be the first such ring? No chance of them being "conflict" or "blood" diamonds. Easier to get colored diamonds: Lab-created colored stones are much cheaper than mined equivalents, and there is much greater selection to find the exact color and specs you want, which is particularly important when looking for matched pairs or larger sets. No involvement from DeBeers, a company many regard as evil for its long-time monopolistic manipulation of the diamond industry prices and its manipulative advertising, as described in the classic Atlantic article, "Have you ever tried to sell a diamond?". More important than the issue of conflict diamonds, natural diamonds help keep millions of people in poverty through the "natural resource trap" (aka "Dutch disease"), as described in Chapter 2 of Paul Collier's excellent book, The Bottom Billion. In the case of other natural resources (gas, metals, etc.) that fetch high prices due to the value they provide to societies through the power or raw materials they provide, one can argue that the natural resource trap at least has a small silver lining. But since the value of diamonds is largely an artificial result of monopolistic price manipulation (see previous bullet point), the poverty that results is particularly sad in this case. If you are interested in diamonds or likely to purchase any, I highly recommend the above 2 articles and the book chapter. In some ways, supporting synthetic diamond manufacturers feels somewhat analogous to supporting alternative energy companies. Gemesis and Apollo are perhaps the best known, having been featured in the Wired article linked above (see the article for more background on each). Thus, I started with these companies. Armed only with the constraint of an emerald-cut shape, initially I sought to purchase a single loose white stone. Apollo made whites but none big enough for what I wanted in a main engagement ring stone---basically none bigger than 3/4 of a carat. Also, Apollo only made round and princess cuts. Supposedly, size was increasing slowly over time and other shapes would eventually follow. 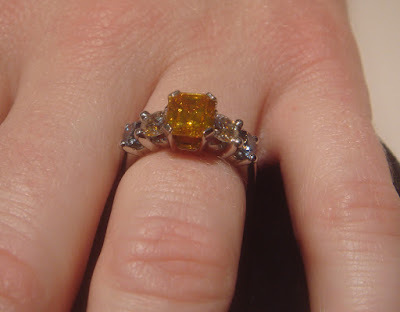 Gemesis focussed on yellow diamonds, some with a bit of orange color. Gemesis produces the rough and then distributes this to one of a handful of partners (listed on its website), which in turn cut and produce the finished stones and then distribute them to individual retailers, which can be found listed on the websites of the partners. Pure yellow was not desirable to us, but orange or orange-yellow seemed like it might work. I checked the closest retailer to me, a retailer of the partner Solaura Jewelry, but they had no Gemesis stones of any shape above 1 carat, though they had seen some occasionally and knew Gemesis had made some as big as 2 carats. Chatham sells through retailers, but with a slightly different process than Gemesis. Chatham's process is more awkward, but possibly has a greater chance of you finding something you want if such a thing is available. One can find a list of retailers on their website. Then you contact the retailer and describe what you want. The retailers don't carry any (or much) inventory in their stores, but when you call, they'll call Chatham. If Chatham has something within the parameters given, they'll tell the retailer the specifics. The retailer then calls you back with the details and asks if you want to look at them. If you do, Chatham sends the stones to the retailer and you make an appointment to go look at them. If you want them, you buy them. If not, they get sent back to Chatham. Since I liked the blue and white colors, but could only get small stones in either, I decided to buy a matching pair in each color to possibly use on either side of the main stone. I figured they could always be made into earings if they didn't end up getting used in the ring. I went through exactly the above Chatham process to buy our blue pair from a local jeweler. The jeweler said he didn't know any details of where Chatham diamonds are actually grown, where they are cut, or whether Chatham cuts them or outsources the cutting, due to the secrecy of the company. The stones came loose, completely loose---just wrapped in white paper. We really like the deep blue color they have. Apollo had 2 websites, one for the company and one for their on-line store, with several jewelry pieces featuring their diamonds, but very little specific info on any of the stones. To really buy anything from the store you had to phone. I had initially determined that all the stones were small, but on deciding to buy a pair of smaller whites, I re-contacted them. At some point the phone conversations turned into e-mails. Throughout these conversations my contact was helpful and friendly. He explained that they produced the rough, had it cut, and then sold the diamonds directly. Adia (now D.NEA) was the last of the 4 companies that I discovered. After looking around their website, I was shocked I hadn't discovered them earlier. They list their entire in-stock inventory directly on their website, complete with prices, pictures of each individual stone, and all the specs---not just the normal Cs, but right down to precise sizes in mm and a very specific color description that can be looked up elsewhere on their site for comparisons with similar colors (for example, their are half a dozen or more different shades of yellow-orange combination). I liked their website for other reasons too---it was the only website of any of the lab-created diamond manufactures that worked in a non-flash-enabled browser (an old Mozilla version on an old Linux machine). less) vs. the lower end of the prices for equivalently sized and graded white diamonds at Blue Nile. I didn't do detailed comparisons for the smaller sizes, but since there are more of the smaller lab-created stones relative to the larger ones, they might be cheaper relative to the natural stones. The Adia website almost made it seem like you could even order a lab-created diamond without making a phone call since there is a "purchase this diamond" link, but that just led to a page with a phone number and a link to Pearlman's website. Pearlman's site listed the same stones but wouldn't let me order them either---I had to call the number. Lucky for me, they had one large orange yellow emerald cut in the perfect size and with just enough orange in it for our tastes. The person I dealt with was great---he talked straight with me and was happy to communicate by e-mail as well. We even had a bit of a frank discussion about the other players in the lab-created diamond industry. I had been afraid that when I called I would find out that the stone I saw on the website that I liked wasn't actually available, but I was pleasantly surprised to find the website was accurate. I ordered the stone. It arrived in an impressive case, with similar display between two clear stretchy sheets as the Apollo case. Later, we would put all 5 stones in this same case to see them all together (see the pictures page). It came with an independent grading report from the EGL. As with the Apollo stones, it was engraved with a serial number and "AOTC Created". Once we had the stones and had finished the task of telling family that we were getting married, we made an appointment to go see a jeweler a friend had used to design her engagement ring after another diamond-only proposal. There was also a brief trip to a mall jewelers, but it was off-putting. We spent the evening before our appointment looking at settings and ring designs on Google Image Search, at Blue Nile, and anywhere else we could think of. We decided we both liked a relatively simple setting with the main stone and either one or both pair of side stones around it, with relatively simple prongs. Click this link to go to the YouTube page for the video. The whole ring design and buying experience at the jewelers was thoroughly enjoyable and interesting. We weren't really sure how well all 5 stones would fit on a single ring. We proceeded to the jewelers. First, a few minutes were spent examining each of the diamonds in jewelers loupes and under a microscope, right in front of us. Each was also weighed, with the weights very closely matching the specs I was given when I bought each. The designer let each of us see each stone under magnification. She said she was in the final stages of studying for a gemological degree and that it was the first time she'd had an opportunity to examine lab-created diamonds close-up. Under 10x or 30x magnification she was able to notice a slight difference between the white Apollo diamonds created with the CVD process and natural diamonds (something I'd heard mention of once or twice before). This difference is apparently not noticeable to the naked eye, nor could my untrained eye see the difference even under magnification. We recorded the serial numbers of the Adia and Apollo stones from the laser engravings on the girdles. She then used an awesome substance called "gem gel" to temporarily mount the stones on a plain band. When all 5 stones were put on, the result looked splendid (see for yourself on the pictures page). We immediately loved it. She then made a colored pencil sketch of what the ring would look like with prongs. We liked the sketch (also on the pictures page) very much. From the sketch, The jeweler created a detailed 3D model using CAD software. From the computer model, a physical wax model was created with exactly the dimensions our platinum ring would have. So a couple weeks after our initial visit, we returned to try it on. Oddly, the wax is purple in color, so doesn't look at all right, but once the 5 diamonds were carefully placed into the prongs it still looked really nice, in an odd sort of way (again, pics on the pictures page). Everything seemed to fit and none of the prongs got in the way of anything. Several more weeks later the final ring was ready. We're both very happy with the ring. Of course, my wife's opinion counts most, and she liked both me and the ring enough to go through with the wedding. She is genuinely happy with both the colors and the fact that the diamonds are lab-created. I'm glad about this, and I had also decided I did like all of the stones when I first saw them, and also love the finished ring. The ring is a good conversation piece so far. Many people notice it and seem to take an interest in how unusual it is. They are generally curious about what types of stones the colored stones are and seem interested in hearing a little bit more about lab-created diamonds when told. After creating this page I stumbled upon an article by Ivan Solotaroff titled "COUNTER Cultured", apparently from a publication called Modern Jeweler. The old link I had broke, but this seems to be the article, which gives a good overview of the current state of the synthetic diamond industry as of the last time I looked around, covering history, the big players including the 4 mentioned here, and current penetration levels and trends. It's much more up-to-date and comprehensive than the now-classic Wired article linked above. For example, it discusses D.NEA rather than just Adia. This article makes it clear that while supply is clearly increasing, demand is also increasing and is still outpacing supply. If that link breaks you might be able to find another link by searching for the title and/or author. Several other interesting pages with largely overlapping content (and possible more up-to-date, but I haven't checked lately) can be found by searching Google for various combinations of the names of the companies involved (Apollo, D.NEA, Gemesis, Chatham, etc.) and the synonyms for synthetic diamonds (lab-created, laboratory-grown, cultured, etc.). Is this blog still being updated? If so, I would like to note that our company offers pure yellow lab growns from a private lab in Asia. 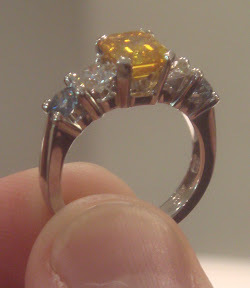 We are able to supply up to 2ct in size for square cuts, and only offer fancy vivid yellow diamonds (i.e. pure yellow, not the typical orangy yellow that most other labs offer). We also have a new supply of blue diamonds as well, all lab grown and with full independent grading reports. I'd be happy to provide updates to this article above based on the latest industry happenings (Chatham is no longer supplying, fyi), just contact us at our site. Anonymous, link is fixed now. Thanks for letting me know. Takara, I had come across the name Takara as a non-US manufacturer but hadn't seen any info on where to order from the US as of a couple years ago. Thanks for chiming in to make this page a bit more complete. Very informative. Thanks for taking the time to share your research and experience. Although you have already bought the diamond, I think you have to add New Age Diamonds to your list of manufacturers. I wonder you haven't discovered it yet. New Age Diamonds also has blues in its collection, as well as yellow, green and red. C5 company is a great source for lab-created diamonds. We source from all of the labs mentioned (as well as others) and therefore can offer the widest selection. Though we specialize in custom jewelry, rather than loose gems, we would be happy to help! http://www.C5company.com. Great article. I've spent about 2 weeks researching and buying lab-created (man-made/synthetic) diamonds now. 7. Lab Created Diamonds - say they offer everything, but nothing works on their website. Go figure. 11. There is one other "eco" diamond place, but I can't find it again! Great post!!! nice to see such creative jewelry. Thanks for sharing your experience with useful information. wow really like the Youtube video. i saw it once and was trying to find it........ and now i finally found it n even managed to get to this blog! i think its really nice and i hope its not that expensive. i am not that rich and i dont think i want to afford 10k on a stone. so lab growth diamond might be the alternative for me. Thanks. This is fascinating. I had a quick look at the synthetic diamond companies and found D.NEA's website the most comprehensive. They clearly state that the price of synthetic white diamonds is comparable to mined diamonds. They also offer only 0.3 ct sizes for sale. So, is there a point in buying synthetic other than to be environmentally conscientious. Are synthetic colored diamonds a better value than natural diamonds at least? Would an all natural (mined) diamond ring with the same size, cut, clarity, color of diamonds been the same or more in price? Great piece. Have a lab diamond myself and have to say, find ti very difficult telling the difference. (to be honest, I cant). Deffo the future for diamonds and engagement rings. Very interesting article.Great work you have done.Thanks for sharing your experience. The ring is a great conversation piece to date. Lots of people notice it and appear to consider a desire for how unusual it's. They can be interested in what kinds of gemstones the coloured gemstones are and appear thinking about hearing a bit more about lab-produced diamonds when told. Great article, learned a lot and very interested to continue learning more! After reading this I am set on purchasing a man made diamond! I heard Scio Diamond has some great stuff? Has anyone else purchased anything from them, would you recommend them? Thanks for posting marvelous ones! I enjoyed reading it. I just bought a Lab Created engagement ring and I love it the price was a bonus too.. Your ring is just gorgeous! I have no need for ideas to clean a ring yet, but these are great ideas. Thanks for posting marvellous ones...!!! Great information and extremely well written and researched!